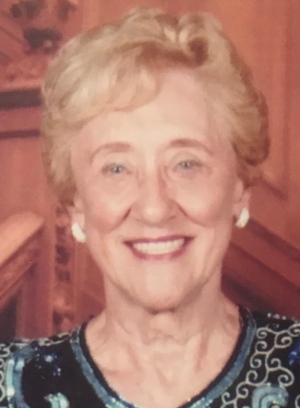 Mrs. Alma R. Johnson, 88 passed away Friday, April 12, 2019 at Cape Cod Hospital and was a resident of Thirwood Place, in South Yarmouth, MA. Alma Johnson was born in Boston, Massachusetts the daughter of Henry L. and Mary Barboni. She was married to Edwin Charles Johnson on September 20, 1953 in Newton, Massachusetts, where they lived and raised their family. He preceded her in death September 29, 1998. They were married for 46 loving years. After graduating from Newton High School in 1949 she attended The Jackson School of Fashion Design graduating with a degree in design, in 1952. She worked for the House of Bianchi as a designer in the design department for over 8 years and semiretired to raise her family. She went back to the House of Bianchi in the mid 70’s to 1988, when she fully retired. Mrs. Johnson and her husband lived in Newton for 35 years, summered in Dennis for 34 years, and wintered in Fort Lauderdale, FL where she was on many committees. While raising her family in Newton she was a Blue Bird and Camp Fire Girl group leader for several years and won an award for her leadership abilities. She also volunteered to help create sets that were used in her daughter’s ballet recitals. She was a member of the Newton PTA while her children attended elementary school and was a congregant of Mary Immaculate Catholic Church in Newton. She is survived by her two daughters and their spouses; Janet and Bob Fasano, Mansfield, MA, and Linda and William Wolaszek, South Yarmouth, MA. 5 loving grandchildren, Jeffrey Wolaszek, Jason Fasano, Bryan Wolaszek, Chris Fasano, William Wolaszek and 4 great-grandchildren, Connor, Cameron, Bryson, and Harper. In addition to her husband, Edwin Charles Johnson she was preceded in death by a daughter, Karen M. Johnson, in 2011, and a brother Henry J. Barboni. The family will greet friends from 4:00 – 6:00 p.m. on Tuesday, April 16, 2019 at Hallett Funeral Home, 237 Station Ave, South Yarmouth, Massachusetts. A Mass of Christian Burial will be held at 11:00 a.m. Wednesday, April 17, 2019 at St. Pius X Catholic Church, 5 Barbara Street, South Yarmouth, Massachusetts. Burial will be at Oak Ridge Cemetery, Dennis, MA. The family would like to thank the caring staff of Thirwood place for all their kindness and support they gave our mom. In lieu of flowers memorial donations may be made to St. Jude Children’s Research Hospital. I have known the Johnson Family since 1962, and have always loved them all. Mom Johnson was elegant, witty and kind. I feel blessed to have known this wonderful woman and her whole family. God Speed to her on her way home to God, and her beloved Ed. Heartfelt Love and Sympathy to Janet and Linda.